My Dad is full of crazy little tidbits… I’m guessing that at some point in my life I will use each and every bit of it and maybe even share it with you :). Today you get the tulip tidbit! My Dad told me to put a penny in the bottom of the vase to make the tulips stand up straight… Guess what? 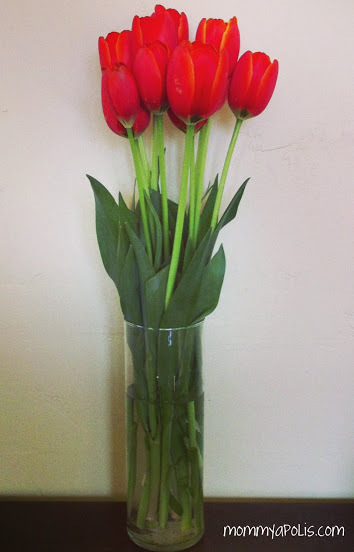 It worked… My tulips have not drooped over one tiny little bit and if you are a tulip fan you know that tulips droop… It’s that simple – put a penny in the vase and no more drooping!